Hydrogel products constitute a group of polymeric materials, the hydrophilic structure of which renders them capable of holding large amounts of water in their three-dimensional networks. Extensive employment of these products in a number of industrial and environmental areas of application is considered to be of prime importance. As expected, natural hydrogels were gradually replaced by synthetic types due to their higher water absorption capacity, long service life, and wide varieties of raw chemical resources. Literature on this subject was found to be expanding, especially in the scientific areas of research. However, a number of publications and technical reports dealing with hydrogel products from the engineering points of view were examined to overview technological aspects covering this growing multidisciplinary field of research. The primary objective of this article is to review the literature concerning classification of hydrogels on different bases, physical and chemical characteristics of these products, and technical feasibility of their utilization. It also involved technologies adopted for hydrogel production together with process design implications, block diagrams, and optimized conditions of the preparation process. An innovated category of recent generations of hydrogel materials was also presented in some details. 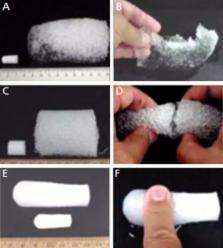 Hydrogel nanoparticles in drug delivery. Hydrogel nanoparticles have gained considerable attention in recent years as one of the most promising nanoparticulate drug delivery systems owing to their unique potentials via combining the characteristics of a hydrogel system (e.g., hydrophilicity and extremely high water content) with a nanoparticle (e.g., very small size). Several polymeric hydrogel nanoparticulate systems have been prepared and characterized in recent years, based on both natural and synthetic polymers, each with its own advantages and drawbacks. Among the natural polymers, chitosan and alginate have been studied extensively for preparation of hydrogel nanoparticles and from synthetic group, hydrogel nanoparticles based on poly (vinyl alcohol), poly (ethylene oxide), poly (ethyleneimine), poly (vinyl pyrrolidone), and poly-N-isopropylacrylamide have been reported with different characteristics and features with respect to drug delivery. Regardless of the type of polymer used, the release mechanism of the loaded agent from hydrogel nanoparticles is complex, while resulting from three main vectors, i.e., drug diffusion, hydrogel matrix swelling, and chemical reactivity of the drug/matrix. Several crosslinking methods have been used in the way to form the hydrogel matix structures, which can be classified in two major groups of chemically- and physically-induced crosslinking. Copyright statement: © 2013 Production and hosting by Elsevier B.V. on behalf of Cairo University.